ACCESSIBILITY: PARKING... Gravel, Dirt combo parking along road (park totally off paved road); PATHS/TRAILS... None; RESTROOMS/FACILITIES/SHADE… None. Shade via trees; SENSORY... No sensory tactile markers for those with visual and other impairments. DOCKS/LAUNCHES/PLATFORMS… None. Launch off bank deep grass and mud; DIRECT WATER ACCESS… No access for wheeled mobility devices; TRANSFER SYSTEMS... None; CAMPING... Primitive Camping; O.T.H.E.R… Oddities/Barriers: Deep grass and mud; Terrain: Varies; H2O/Water: Water normally murky. Water temperature in the summer can be around 60 to 70 degree. 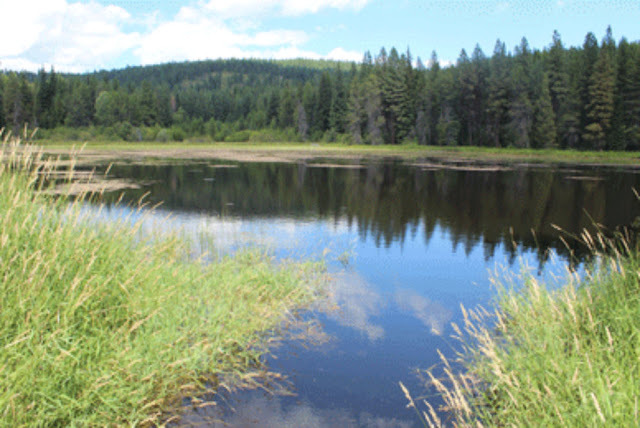 No drinking water available; Environmental Conditions: Varies; Resources: Food, drinks, and gas in Potholes Reservoir resort area and in town of Cusick WA.